This follows the previous post which discussed the Celestial Co-ordinate System. If we wish to use a celestial body’s position in the celestial sphere to help us to navigate on the Earth’s surface, we must be able to translate that body’s celestial co-ordinate position into a geographical position expressed in terms of our earthbound geographical co-ordinate system. As we discussed in the previous post, we express a celestial body’s position in the celestial sphere in relation to its angular distance east or west of the celestial meridian that passes through the ‘First Point of Aries’. Similarly, in the geographical co-ordinate system, we express a position on the Earth’s surface in relation to its angular distance east or west of the Greenwich Meridian. The ‘Declination’ of a body expresses its angular distance north or south of the Celestial Equator in the same way that we use latitude to define a position north or south of the Equator. The following explanation requires a little imagination. In this diagram, the Greenwich Meridian is projected onto the Celestial Sphere. Point X denotes the position of star Acamar in the celestial sphere and PRP1 represents the meridian running through the position of Acamar. The Sidereal Hour Angle (SHA) is the angular distance from the meridian of the First Point of Aries to the meridian of the celestial body (R) measured westwards. The Greenwich Hour Angle of Aries (GHA Aries) is the angular distance, measured westwards, from the projected Greenwich Meridian to the meridian of the First Point of Aries. 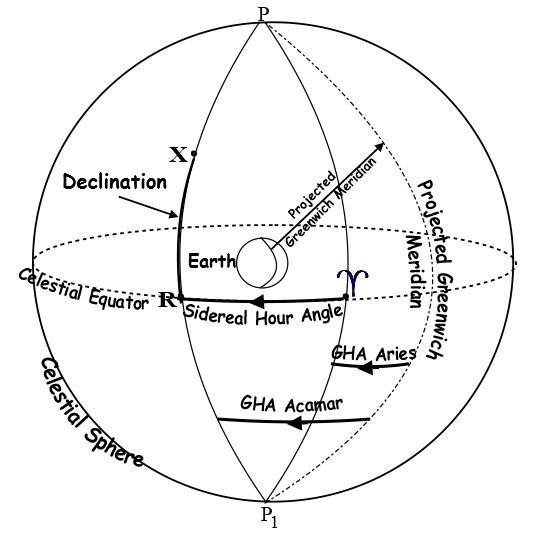 The Greenwich Hour Angle of Acamar (GHA Acamar) is equal to the SHA Acamar and the GHA Aries. Longitude of the Geographical Position of Acamar. The GHA is equivalent to the longitude; however, we must remember that GHA is measured westwards from the Greenwich Meridian from 0o to 360o whereas Longitude is measured either east or west from Greenwich from 0o to 180o. Therefore, in this case, since the GHA of Acamar is greater than 180o, the longitude will be East so we must subtract it from 360o to convert it to an easting as follows: Longitude = 360o – 341o 59’.80 = 18o 00’.2 East. Declination of Acamar = S40o 14′.3 (Note that the declination of the stars can be regarded as constant and so no further calculation is necessary). Latitude of the Geographical Position of Acamar. Since the declination is equivalent to the latitude, we can state that the latitude of the GP is 40o 14′.3 South. We can now state that we have translated the celestial co-ordinates of Acamar from SHA:315o 20’.50, Declination:S40o 14′.3 to a Geographical Position of 18o 00’.2 East, 40o 14′.3 South. Note. It is not necessary for the navigator to calculate the GHA of the Sun, Moon and planets because the Nautical Almanac tabulates these for you. This topic is explained in far greater depth in my book ‘Astro Navigation Demystified’. Using The Geographical Position (GP) Of A Celestial Body To Determine Our Own Position. By measuring the altitude of a celestial body, we are able to calculate the zenith distance which will give us the distance in nautical miles from the observer’s position to the geographical position of the body. The azimuth will give us the direction of the GP of the body from the observer’s position. This explains why measuring the altitude and azimuth are the first steps in determining our position in celestial navigation. Those who wish to learn how we do this can follow this link to find a brief explanation: Astro Navigation in a Nutshell. However, ‘Astro Navigation Demystified’ contains a more comprehensive explanation.